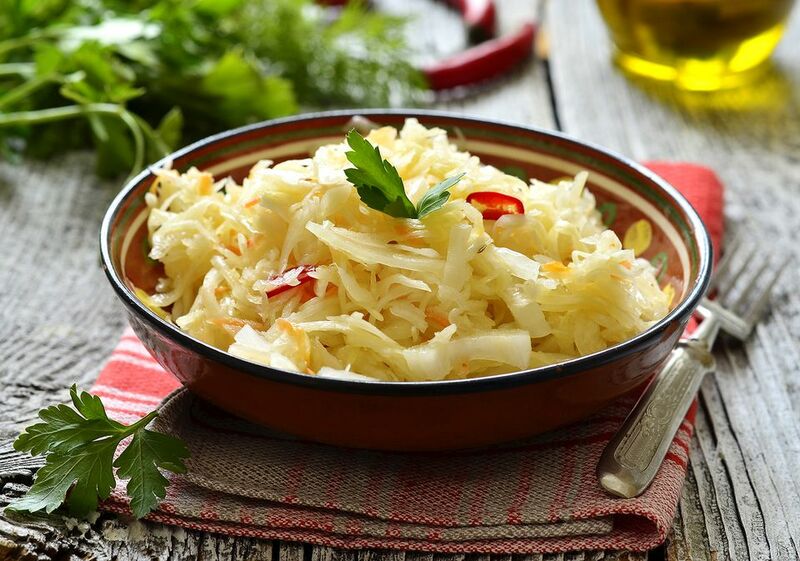 This recipe for Serbian sweet sauerkraut salad features diced bell peppers, onion, and celery and is dressed in a neutral oil like canola or vegetable. Compare this with an oil-free sauerkraut salad recipe. To reduce some of the tartness, you can drain the kraut and rinse it, if you desire, and then squeeze it dry. In a large nonreactive bowl or plastic container with a lid, mix with sauerkraut, bell pepper, onion, celery, and pimiento. In a separate small nonreactive bowl or plastic container, combine sugar, vinegar, water, and oil, mixing well. Toss with sauerkraut mixture until thoroughly combined. Cover and allow to marinate in the refrigerator overnight. When ready to serve, remove as much of the marinating liquid as possible by using a slotted spoon to transfer the salad from the storage container to a serving bowl. Keeps refrigerated for up to 2 weeks. Making sauerkraut from scratch isn't as difficult as you might think. Probably the hardest part is shredding the cabbage and, with today's tools, that's not hard at all. German Sauerkraut Made in a Mason Jar Recipe: This easy, small-batch method of making sauerkraut in a Mason jar takes about three weeks to be at its salty-tart best. Croatian Soured Cabbage Heads Recipe: In this kiseli kupus recipe, whole heads of cabbage are soured in huge crocks or barrels for about 40 days. The leaves from these soured cabbages are often used to make sarma or cabbage rolls.